In the recent years, there appears in many hotels, restaurants, parks and private houses a special and interesting plant: its green stalks are thick and fleshy. The stalks bulge out, then, they stretch upward, finally, at the end of the stalk, many leaves come out; the leaves are as green as bamboo leaves, and are as big as banana leaves. There is also a marble-shaped hole among the leaves. On the edges of the leaves, there are many cracks, and the whole leave is like the stripes on the back of a turtle. This is a famous ornamental plant - ceriman. Why the leaves of ceriman are so strange? The creator is really miraculous. As a matter of fact, the leaves of ceriman do not look like this at the very beginning. When the leaves first spread out, they are round-shaped. As the leaves grow larger, cracks begin to appear on the edges of the leaves. When the leaves grow as large as a fan, the marble-shaped hole begins to appear in the leave veins. The readers may wonder why the leaves of the ceriman have such ecological changes? ceriman originally grow in the rain forests of South America. 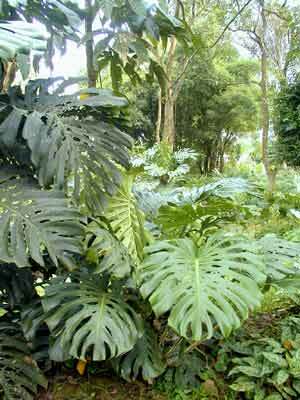 Storms are frequent in that part of the world, and so, the large leaves of ceriman are often under attacks. In order to cater for the environment and to survive, it gradually cultivates the ecological propensity in natural selections. In the process of the leaves' growing larger, the plant gradually grows some cracks and holes for the purpose of mitigating the wind and draining the rain water, in this way, it could avoid the damages caused by winds and rains. If you place a basin of ceriman in the living room, you would find a lot of amusements. Look at its funny appearance: it has round and large leaves, which are exuberant and strew at random, and are rich in vitality and beauty, as if many tortoises are making stupid shows for amusing people.